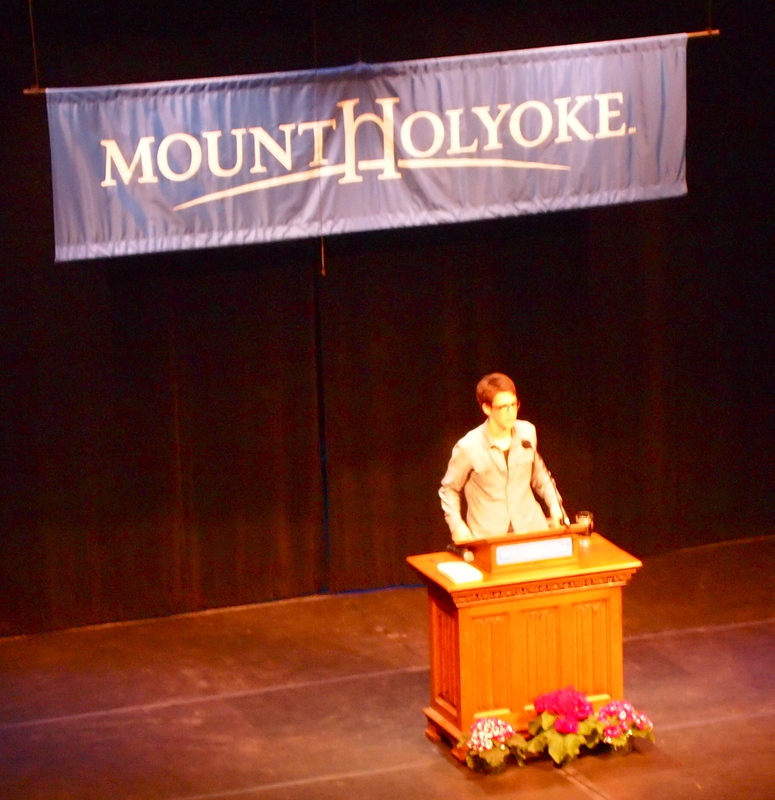 Thoughts in my Head: Constitutional Liberty & Seeing Rachel Maddow. Last week has been one rife with meeting famous people. Or, if not meeting, sharing atmosphere with them. Or TV time. Whatever. On Wednesday, i went to a panel discussion on whistleblowing in America to hear, most predominantly, Daniel Ellsberg speak. Yeah, the Daniel Ellsberg, of the Pentagon Papers fame, accredited largely in part with tipping the cards in favor of ending the Vietnam War. While his compatriots on the panel, Thomas Drake and Jesselyn Radack, were considerably grave and constantly on the offensive, he was congenial, relaxed, and yet undeniably shrewd. It was a tense atmosphere; all three people on the panel spoke of their willingness to die in order to uncover illegal and immoral activities enacted within the most secretive – and most powerful – corners of the US Government. Their homes had been raided, they had been threatened with prison, and they were blacklisted traitors by those in power. And yet all three of them avowed that they would make the same decision to whistleblow again were the situation presented once more. And though the image that will forever first come to mind when reflecting on the panel will be Thomas Drake quoting Spock (“The needs of the many outweigh the few for the one” from a movie version, in case you needed to know), foregrounded in such recollections will be their commitment to the liberty promised by the American Constitution. It’s a thought i hardly ever give any credence to; not exactly the biggest fan of “The Founding Fathers” myself as they are in, in the American psyche, more fiction than fact in my opinion. But the document rendered after the Articles of Confederation – the Constitution – is incredibly radical. And these people had committed the entirety of their lives to defending the rights it stood for. Whatever my personal qualms or questions entangled with that may be, i have to respect it. Which brings me to my almost-asking-a-question of a woman for whom i have the most immense respect; none other than the namesake of this very blog post, RACHEL FREAKING MADDOW. On Saturday night, she stood before a crammed auditorium overflowing with members from the general public and more politically engaged MoHos than you could, to use my mother’s phrase, shake a plaid-covered NBC-logo-bearing stick at. (Maybe not precisely how she says it). Rachel. Freaking. Maddow. 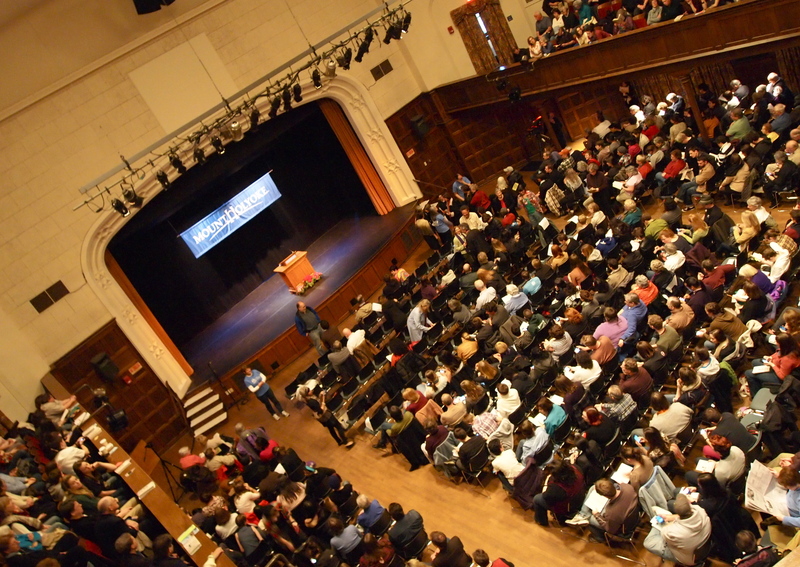 Fly as hell, as laid back as any Mount Holyoke student, and as cool as the cats come. With what certainly felt like an extemporaneous speech, she prefaced her book with the speech that “politics are my thing” more so than the military, but she wanted to explore the politics of the military and so she’d written a book. No big deal, or anything. 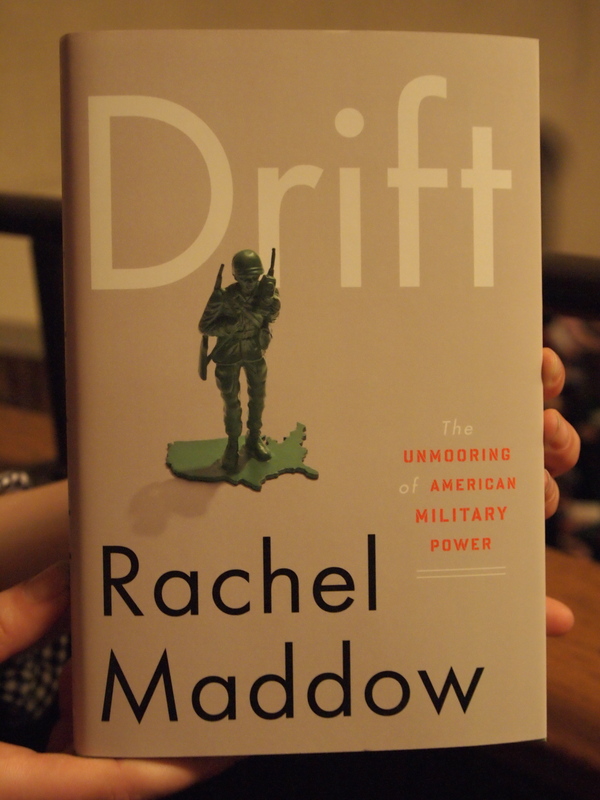 Without any real ado, she dove right into reading a passage from her literary debut, Drift: The Unmooring American Military Power, a passage that she clarified was her favorite because it involved the Houbara Busterd, a bird that can excrete green slime as a defense mechanism. She clarified, giggling at herself whilst somehow, in the ultimate unfairness of the universe, maintaining such an unattainable level of awesome and intelligence i kind of melted into my edge-of-the-balcony seat. While i don’t have any direct quotes to give you from the book, i can give it my whole-hearted endorsement to read. I intend to get my hands on a copy just as soon as i crawl out of this campus long enough to breathe air untainted with whiffs of “i-should-be-studying-itis.” But, really. Her wit comes through in her writing, but more importantly, so does her unyielding and excellent journalistic research. The book is clearly as thoroughly researched as her show and blends that perfect Maddow cocktail of classic reporting with modern sensibilities. And her arguments for the declension of America’s understanding of war are, from what i could gather through this reading and subsequent Q&A session, nothing less than provocative and nothing short of brilliant. Though both of these events, the panel on whistelblowing and Rachel Freaking Maddow, were not nominally about the same thing, i’ve come back to this question: how important is it to us, as Americans*, to defend and question the Constitution? We seeks always to “better” what has come before – a practice i endorse – but when i consider contemporary political discourse with the impending election, i see very little conversation about they best way to interpret our founding document. We are getting it wrong. If the whistleblowers were willing to lay down their lives to defend liberty – and the people whom Maddow talks about in the military were willing to do the same – don’t we owe them more than petty, useless bickering? current jam: “some nights” fun. best thing in my life right now: wizard rock and maddow.